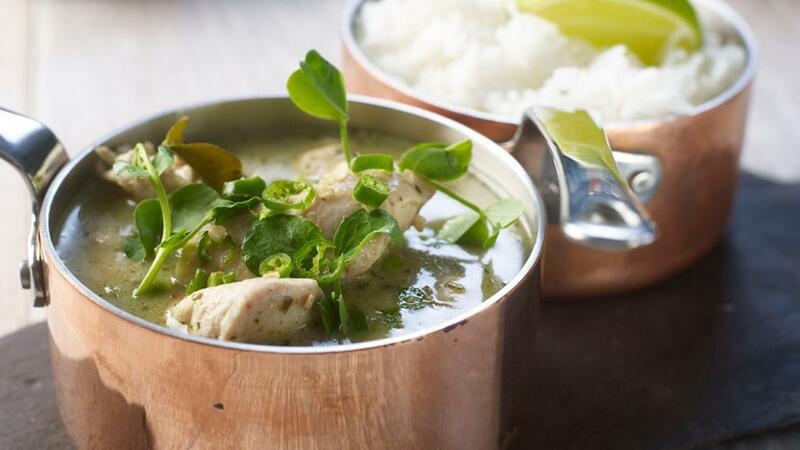 "Kaeng khiao wan gai" translates as "sweet green chicken curry" - A rich, relatively mild Thai curry with its origins in Persian cuisine. Try out our scratch recipe or save time by using our Blue Dragon paste. Trim and rinse all the ingredients then blend together into a smooth paste. Adjust seasoning to taste then cover and chill (can be frozen) until required. Fry the green curry paste for 2-3 min. in vegetable oil then add the coconut milk, stock, fish sauce, lime juice & leaves and sugar and bring to a simmer. This stock can be held at this stage ready for addition of vegetables and chicken to order during service. Pour the sauce into a saucepan and bring to the boil then add the vegetables and chicken then reduce the heat and simmer for 3 min. Turn off the heat, allowing the chicken to cook through gently in the hot sauce over 1-2 min. Season to taste and garnish with the chopped herbs.